Originally published in 1977, this book looks at the problem of educating highly intelligent and gifted children, which it felt was of paramount importance to modern society. In the 1970s education increasingly focused on average pupils, and often made excellent provision for handicapped children, the authors felt it all the more important for teachers, parents and educationalists generally to be made aware of the special needs of the bright and talented, and how they could best be catered for. 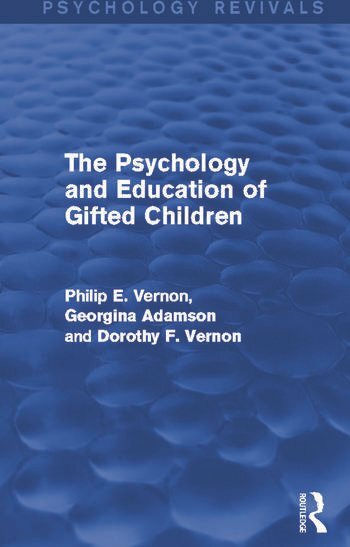 In this book Professor Vernon and his two co-authors discuss the provision of special facilities for the education of these children at the time, particularly with reference to the UK and Canada. The serious losses to society when the gifted and specially talented are ignored or repressed are pointed out and the merits and difficulties of alternative schemes are underlined. Detailed consideration is given to the psychological origins and nature of intelligence (both genetic and environmental) and of creativity and special talents (artistic and scientific), and also to available tests and other techniques for identifying exceptionally able children. The book was particularly intended to help teachers and educational administrators of the time, together with the parents of very bright children.